Today, I'd like to pay tribute to an amazing woman, gone for decades now, who made this world a considerably happier place for many of us tea lovers, Ruth C. Bigelow. I just got through reading her son David's 2008 book, "My Mother Loved Tea," and I was so surprised and inspired by what I found inside! The R.C. 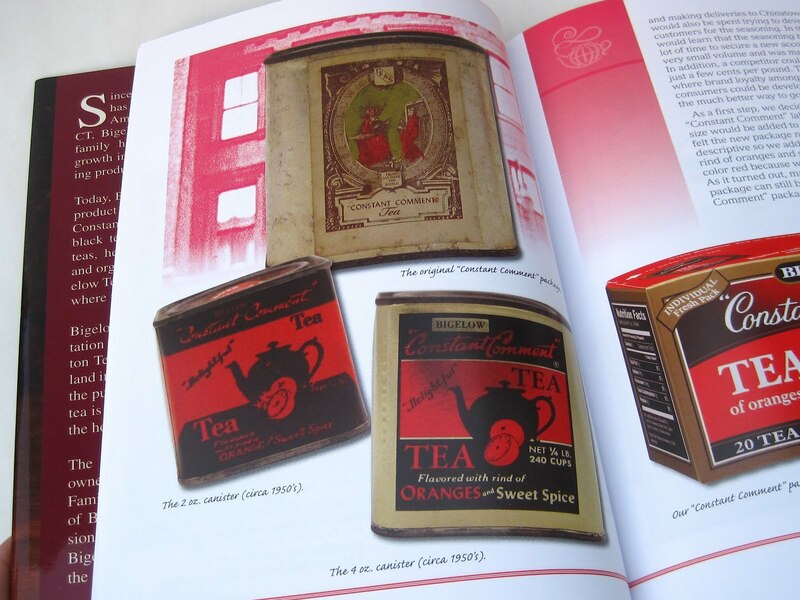 Bigelow Company got its start, David says, when his mother, Ruth Campbell Bigelow, created the famous Constant Comment blend of tea. In 1945 only black tea was available in most grocery stores, so that was the only choice that existed. "Believe it or not," says David, "there was no such thing as a specialty tea to be found and in Ruth Bigelow's mind, this was wrong." 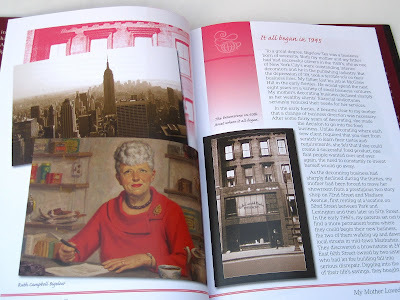 Ruth was originally an interior designer and her husband, David Sr., worked in the publishing industry, but during the Depression both their careers took a hit and they needed another livelihood. 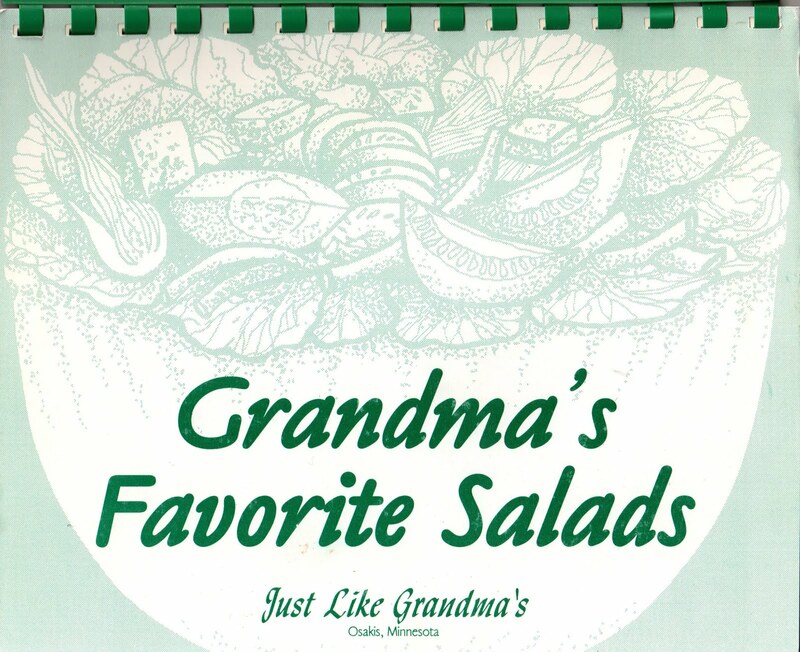 Ruth's idea was to come up with a successful food product for them to sell, and at first that product was a Chinese seasoning they sold to restaurants. Eventually, her thoughts turned to her first love, tea. 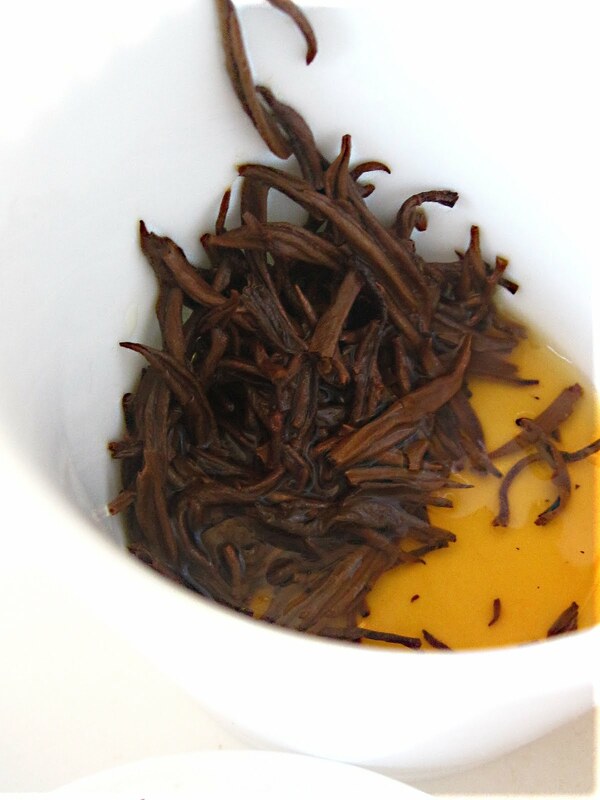 David says that his mother learned from a friend about a tea that had been popular in the South (!) 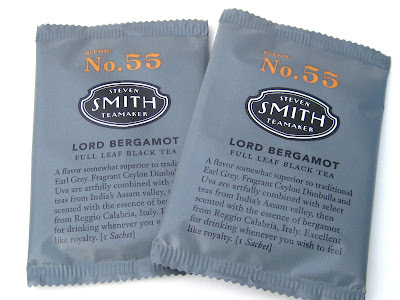 during Colonial times, a blend containing orange peel and sweet spice. The story goes that after experimenting in her kitchen for weeks, she shared this new blend with a friend who served it at "a social occasion" and reported back, "Ruth, your tea caused nothing but constant comments." Ruth latched onto the name, and a tea star was born! The story of Constant Comment's rise to fame is a fascinating one. 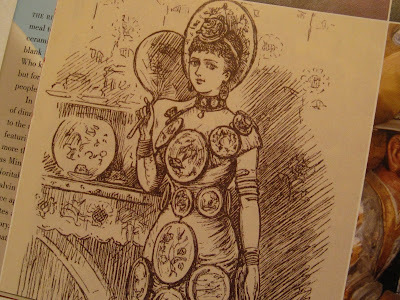 For one thing, even Ruth's husband found it hard to believe the tea would be successful, and grocers were reluctant to take on an unknown product. Through sheer persistence and belief in her tea, Ruth got her Constant Comment in grocery stores, department stores and gift shops, bringing to mind that classic old saying about how "the one who says it can't be done should never interrupt the one who is doing it!" The business eventually grew to include Ruth's son David and his wife Eunice, and in later years, their daughters Cindi and Lori. 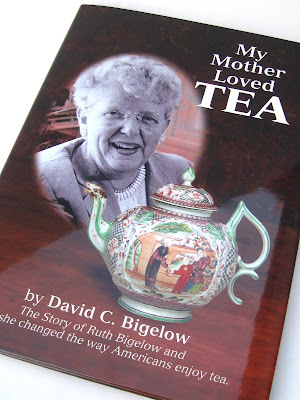 It's really incredible to imagine what might have happened if Ruth Bigelow had not had such a passion for tea. Would specialty tea ever have made its way into mainstream American culture, and if so, how long would it have taken? 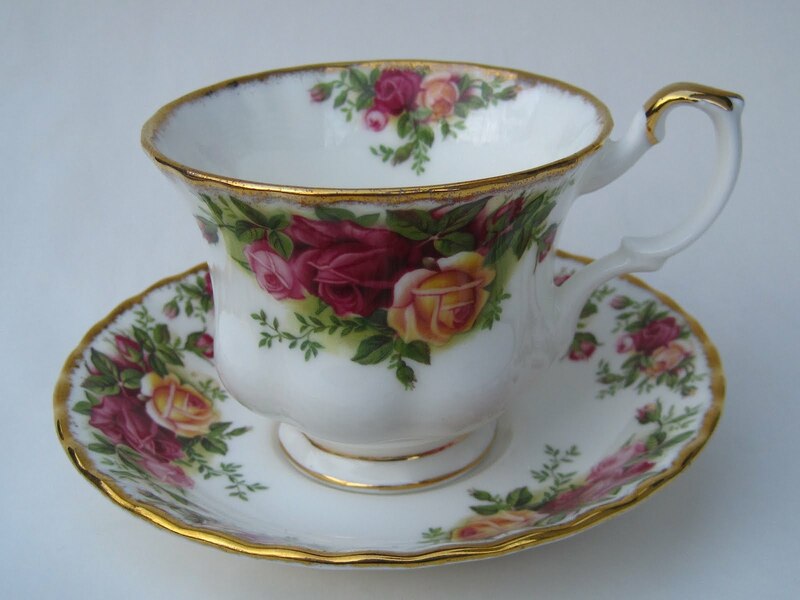 Thanks to her, we don't have to worry about that, so today I lift a teacup full of gratitude to Ruth C. Bigelow! 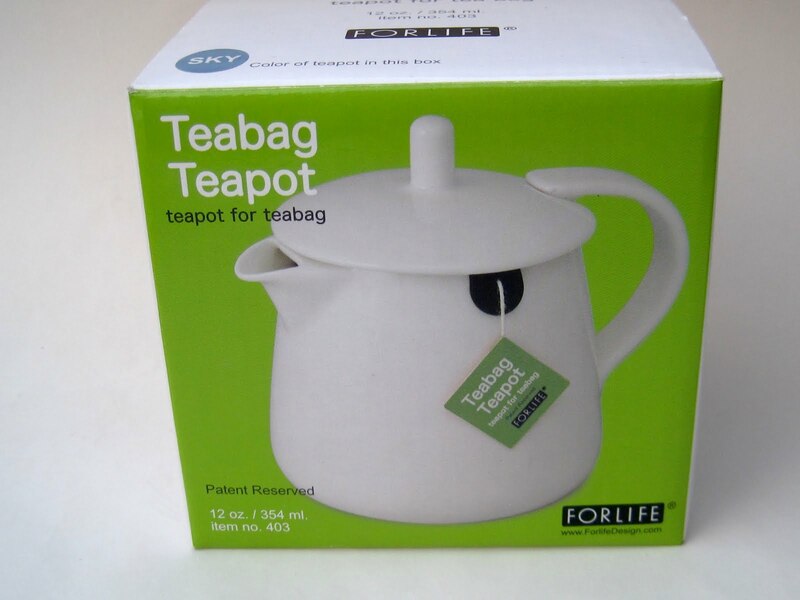 The "For Life Teabag Teapot"
For several years now I have seen this "For Life Teabag Teapot" in various tea catalogs, but I didn't technically *need* one so I didn't order one, although I remained intrigued by the design. I liked the idea of having the little slot on the side where a teabag tag could slip through. 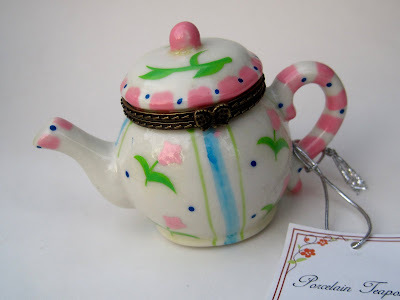 When I won the teapot in Linda of Friendship Tea's giveaway last week, I was doing the happy dance! 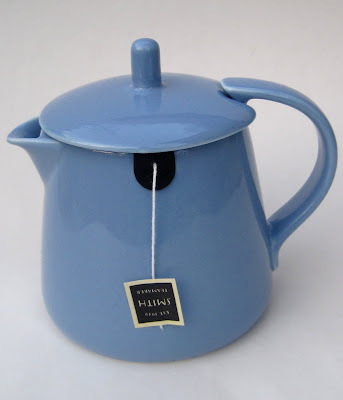 The box showed a white teapot, but I was tickled to open it and discover this lovely blue one! I have been quietly collecting a few assorted blue teawares for my beach house (which I don't have yet!) since last year. 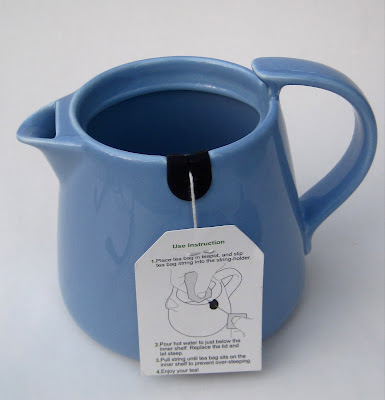 I was also very happy that the maker of this teapot had provided a tag in this slot to show me how the teapot works. When I saw this teapot in catalogs, I did not realize there was actually a rubber slot here that grips the thread of the teabag. 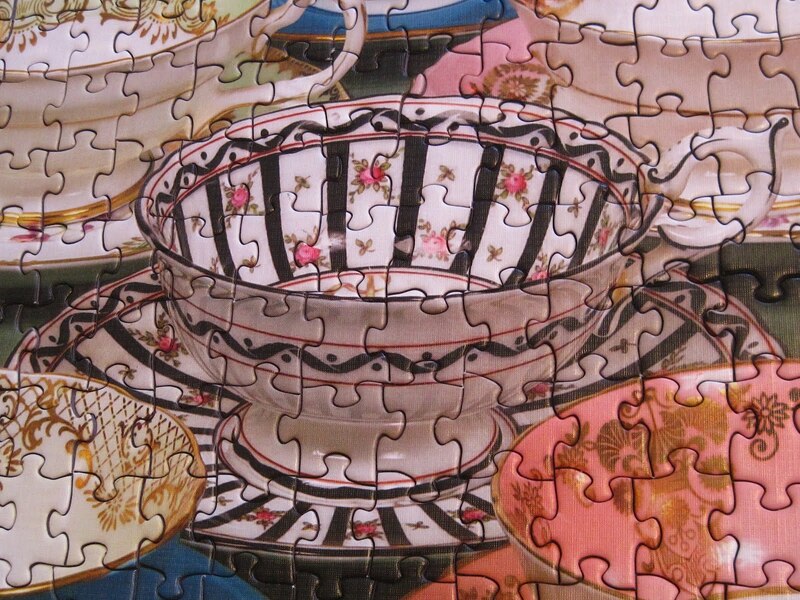 In the photos, I thought I was just seeing "air" in that dark spot on the side of the teapot. Immediately, I realized what a smart feature this is. 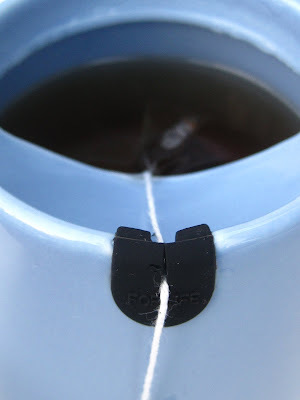 You can reel in the teabag if you like to stop the steeping, and if you're a re-steeper, as I often am, you can lower it again for the next brew. Brilliant! For my inaugural run with this new teapot, I tried another gift I received in Linda's giveaway, the Lord Bergamot tea from Steven Smith Teamaker. It was a fine bergamot-flavored tea, and I'm sure I enjoyed it all the more because it was made using a great new teapot! 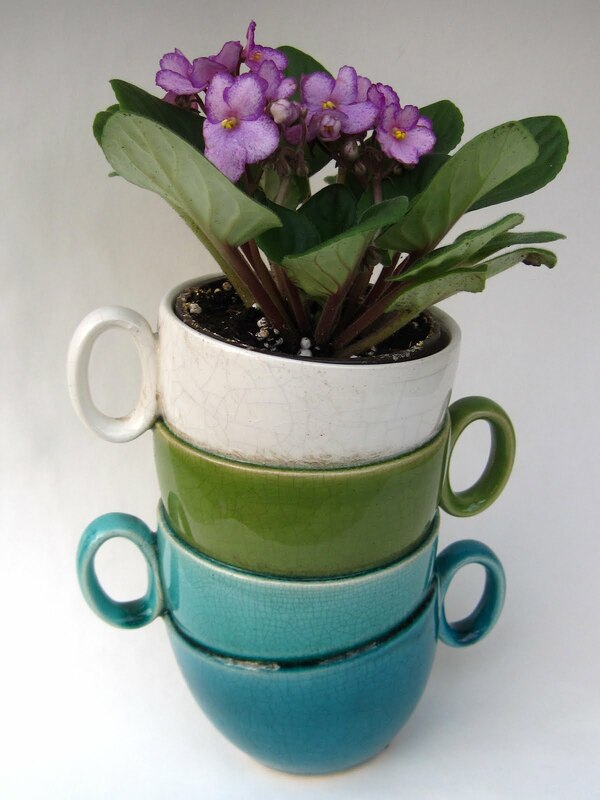 Who doesn't want a few flowers to brighten up the dull winter days? I sure do, and when I saw this planter at Hobby Lobby last week I knew it had to come home with me with a new violet in it. It's regularly $29.99 but happily the ceramics were all half off. Nice! I also liked the crackle finish on this piece, and when I showed the planter to my husband, he actually nodded and said, "That's our palette." Yes, yes it is! 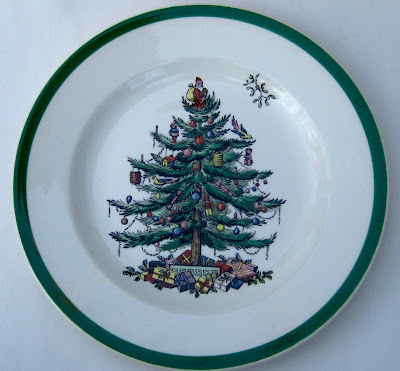 And it also looks like the real-life version of the image on those teacup dish towels I showed yesterday. Double fun! 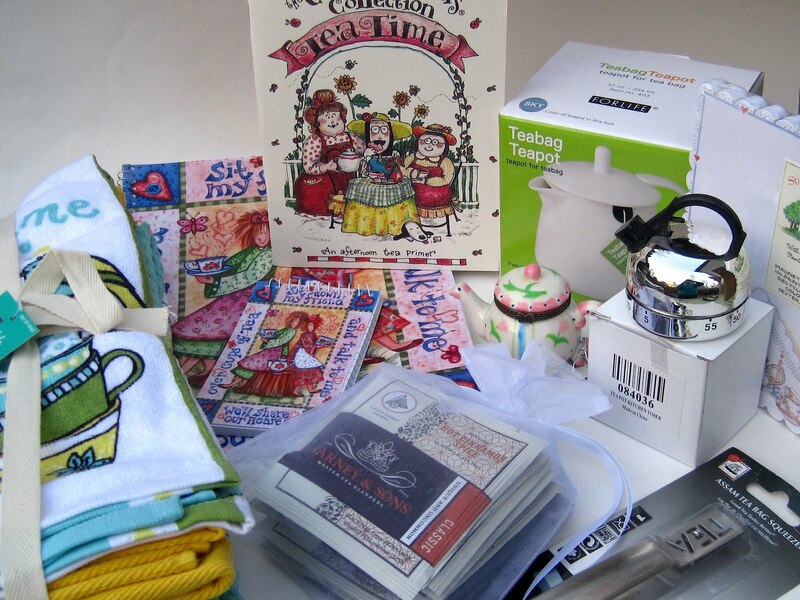 Friends, next time Linda at Friendship Tea says she is offering a giveaway containing a "grab bag" of tea items, run! Do not pass go, do not collect $200, get yourself over there and leave a comment, because I hit the jackpot and won such a giveaway last week. Now here's what I was expecting. But HERE's what all I got in the mail over the weekend! Have mercy! 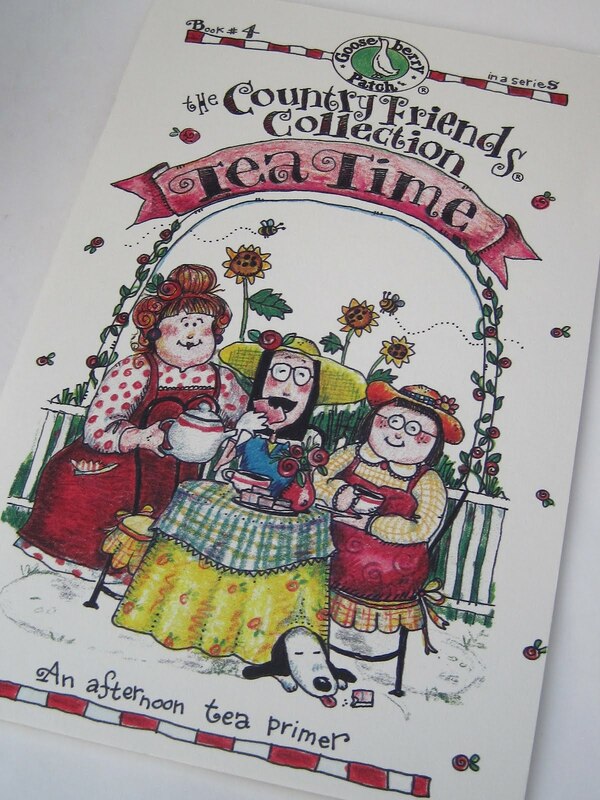 My husband watched as I gleefully removed gift after gift from the box, like this cute booklet of some great teatime recipes with whimsical drawings! 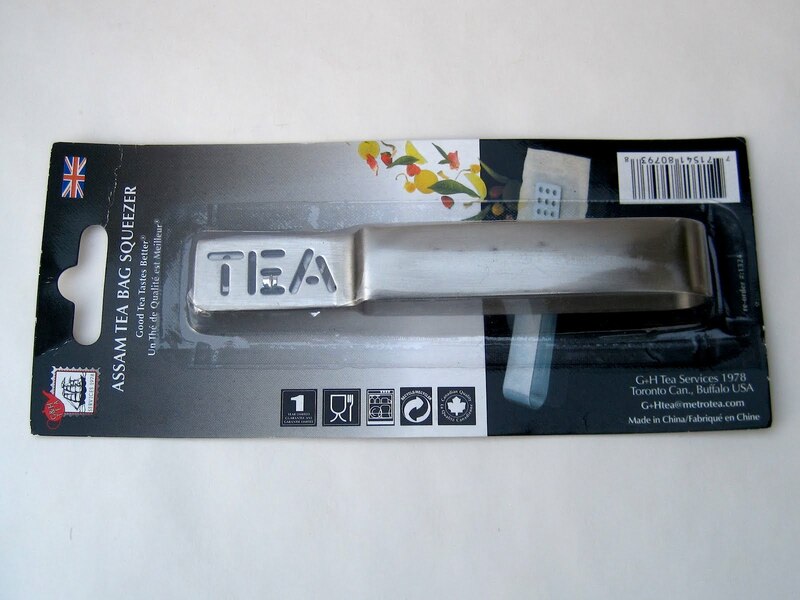 This teabag squeezer was a most welcome gift. I have one at home, and love it, but I've *needed* one at the office. I've been using a spoon to schlep my teabag out of the teacup at work, and it will be ever so much nicer to have this on hand! 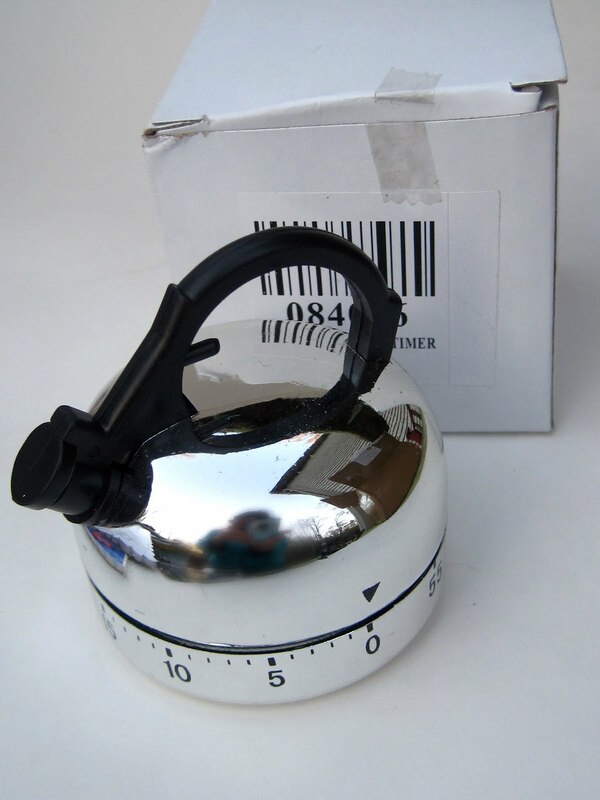 A tea kettle timer ... suh-weet! 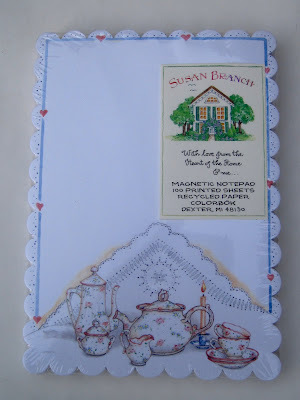 Much as I love those $1.50 stationery bins at Michaels with their often tea-themed items, I must say I do love when I receive "nicer" tea stationery, such as this charming magnetic notepad by Susan Branch. I try to fill up a notebook a month as part of my writerly self-discipline, and here's the one I will be using in February! 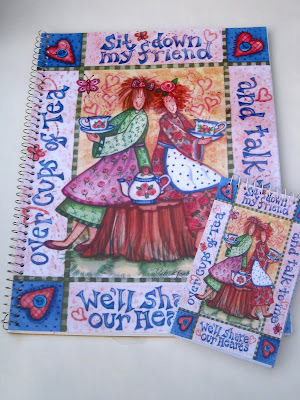 Funny, my first inclination is still, "Oh, I should *save* this for another day," but lately I've come around to believing the time to use "the good stuff" is now, today, THIS moment … so yes, I plan to use the notebook in February. And a matching notepad for my purse! 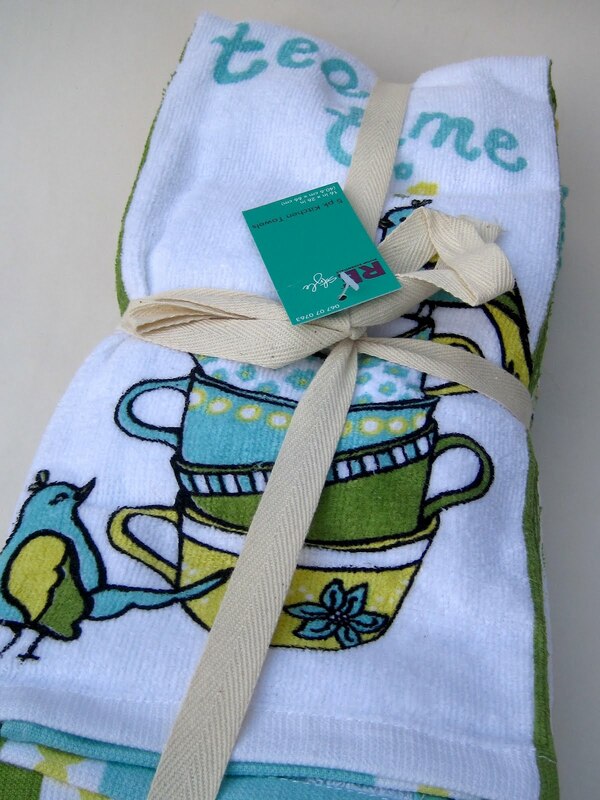 And last but not least, a huge stack of cute-cute-cute dish towels with teawares on them! (I couldn't help being quite amused with this particular graphic, and tomorrow I'll tell you why.) As a friend of mine says, "I'd rather walk on my lips than brag," but I couldn't help sharing this incredible gift! And I'll be excusing myself from Linda's giveaways for a long time to come, as it would be greedy to ask for more than this great bonanza of tea goodies! When I found an online listing for the Rose and Thistle Tea Room's 1988 cookbook, I ordered a copy not knowing exactly where the tea room was located. I had discovered that a Shamrock Rose and Thistle Tea Room had been located in Mobile, Ala. but was now closed. When my book arrived, I was surprised to find the tea room was in Kingsville, Ontario! 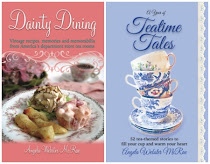 But hey, I like tea room cookbooks from anywhere, and Canada has always been sort of like America's first cousin in my mind anyway, so groovy, a Canadian book with some yummy new recipes to try. In a cookie-baking mood, I opted to try the Almond Cookies. 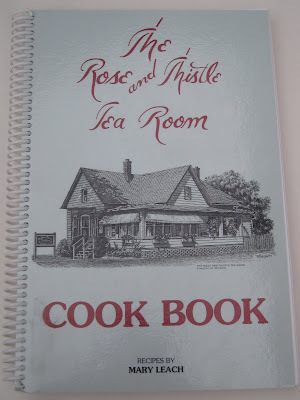 A little internet research, by the way, reveals the Rose and Thistle Tea Room is now the Victorian Rose Tea Room & Restaurant. When the original tea room closed, it was purchased by a former cook! I love that! You can visit their website here if you'd like to learn more about the present tea room and restaurant. 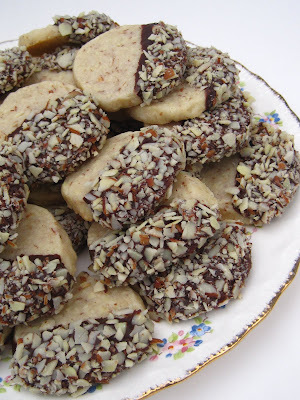 This cookie recipe caught my eye because it's one of those cookie doughs you shape into logs and then slice. 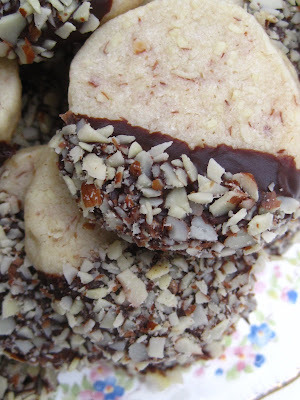 I find these are easy and produce perfect cookies, so I was intrigued. Also, I should mention that the chocolate chip "dip" is created a bit differently than most. This one called for butter and hot water to be added to the chocolate chips, and I must say that when I microwaved it in 20-second increments, it created a dip that was absolutely perfect, not too thick and not too runny. I would never have added water to such a recipe, so it was fun to learn a new trick. And these cookies are absolutely scrumptious! Cream butter, then add sugar, egg yolk and vanilla. Stir in flour, salt and almonds. Use hands if necessary to combine. Dough will be very stiff. Divide dough in half and shape into logs. (Mine were 10 inches long.) Wrap in plastic wrap and chill. With sharp knife, cut into slices 3/8-inch thick (the recipe said 1/2-inch, but I wanted mine thinner). Bake at 350 degrees for 10 minutes on greased cookie sheets, or line sheets with parchment paper. Let cool completely. 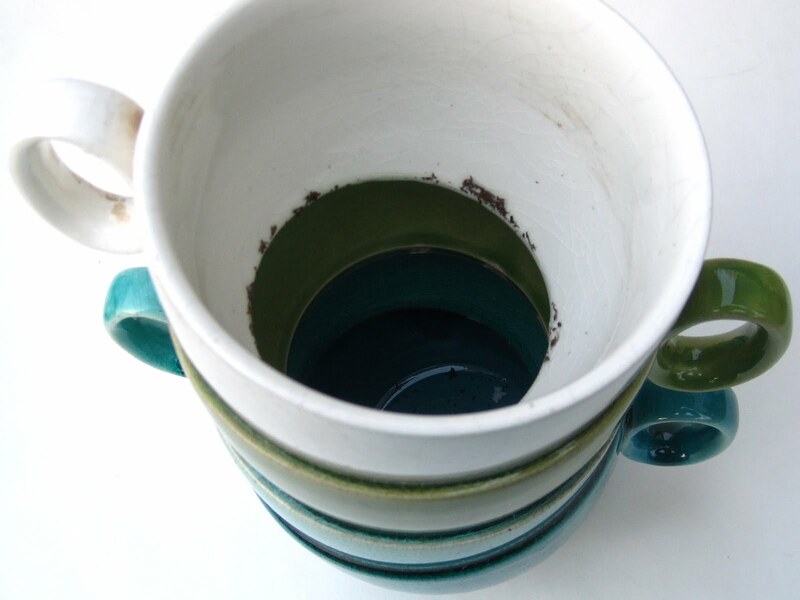 Make dip by melting chocolate chips, butter and hot water in microwave or over a double boiler. Dip half of each cookie in chocolate and then the almonds. 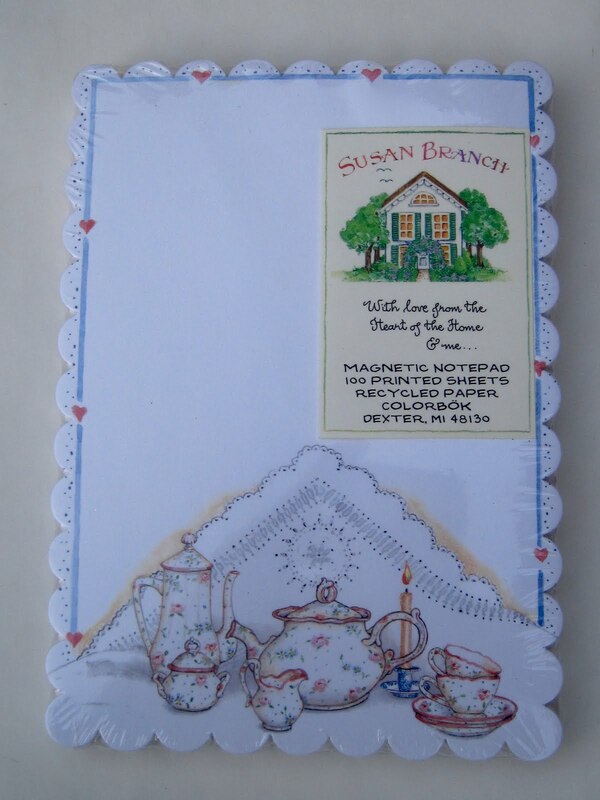 Let set on parchment or wax paper. Yields 6 dozen cookies according to the book, but 4 dozen cookies the way I made them, and my cookies were about 1-3/4 inches wide. Thanks to the ease of slicing up the dough rather than spooning it, these baked up super fast and I had them all dipped in no time! 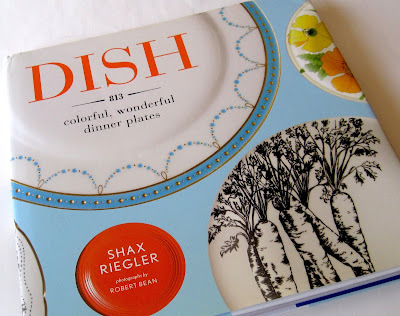 There are those of us who have a real passion for collecting dishes, and now we have a fine book to indulge our dish lust, "Dish" by Shax Riegler. 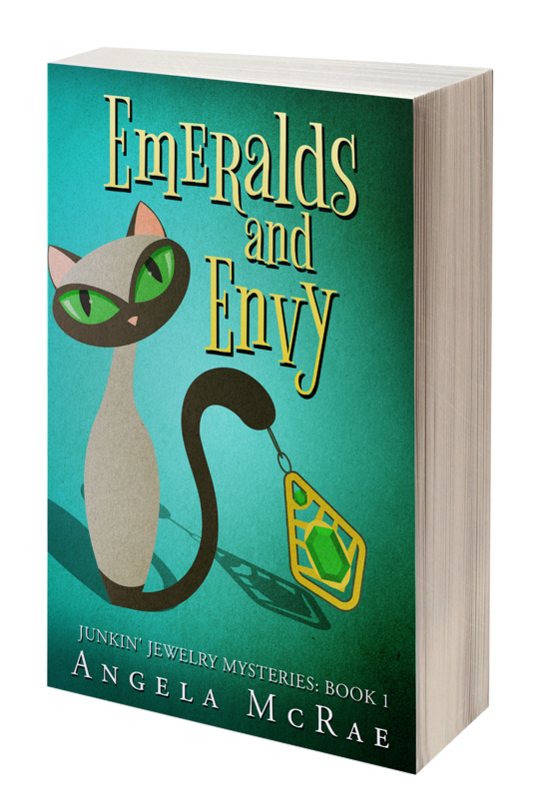 It might be the sort of book some of us should stay away from, though, for it's impossible to read a chapter without finding something new to love! 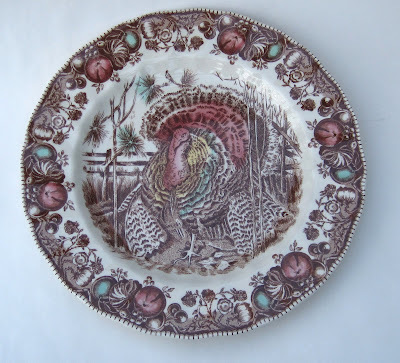 Riegler says that in the late 1600s, some dish collectors were said to have the maladie de porcelaine, or "porcelain sickness," a desire to acquire more and more dishes. (Guilty!) By 1880, this cartoon in Punch's Almanack was making fun of the dish craze by showing a young English lass wearing a dress made of dishes. I wonder what that cartoonist would think of this dress I saw at Anthropologie over Christmas! There is so much to love about this book I hardly know where to begin, but I can tell you that one of my favorite chapters was the flower-laden one on patterns featuring "Flora & Fauna." 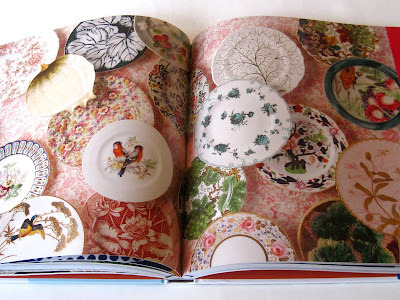 In the opening spread, I was charmed to see so much floral chintz, as well as my Johnson Brothers Rose Chintz pattern at upper left. • In 1518, a rich Roman banker wanted to impress his guests by insuring that no plates were used twice during a banquet, so he had servants toss all the plates used during a course into the Tiber River. Afterwards, the pieces were retrieved from a net that had secretly been lowered into the river beforehand! 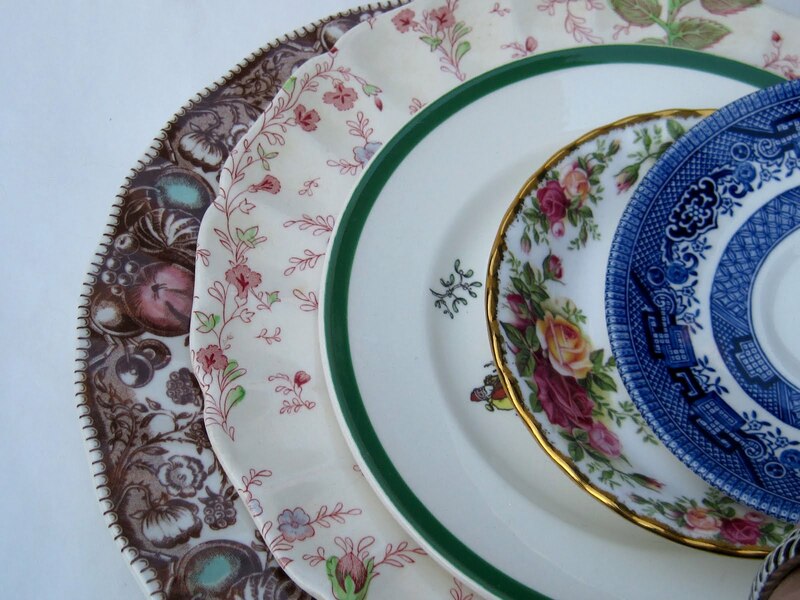 • "The white china plate is the little black dress of the dining table," he says. 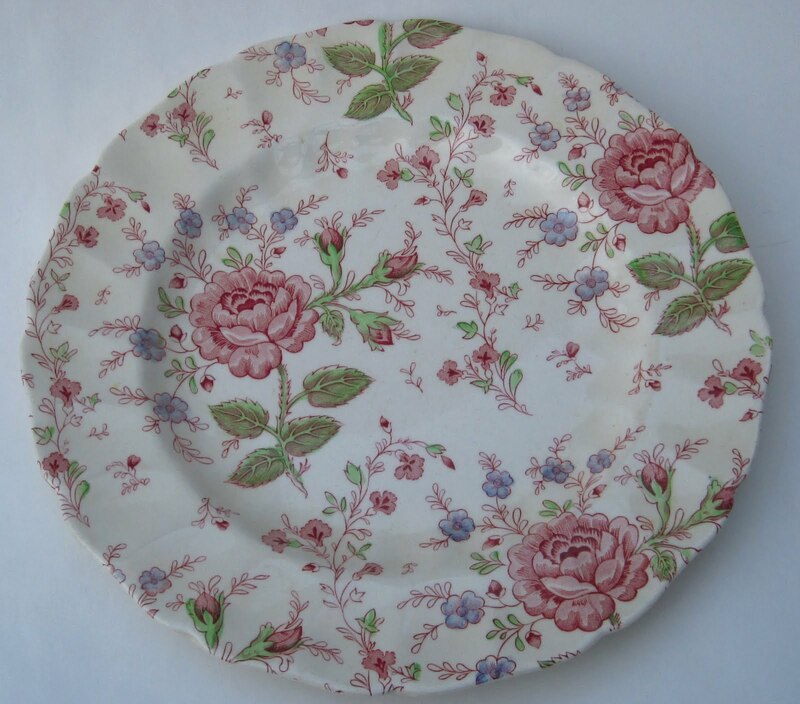 • Portmeirion Potteries in England was founded in 1960 and "launched its first Botanic Garden pieces in 1972 after founder Susan Williams-Ellis bought Thomas Green's 1817 book The Universal Herbal and decided to apply the illustrations to tableware." I didn't know that! Oh, and my five patterns from yesterday? They're among those pictured in the back of the book, part of a list of the 100 most popular patterns ever as named by Replacements, Ltd. in North Carolina. If you're like me, you'll enjoy checking to see if any of your patterns are on this list! Today we have a pop quiz. 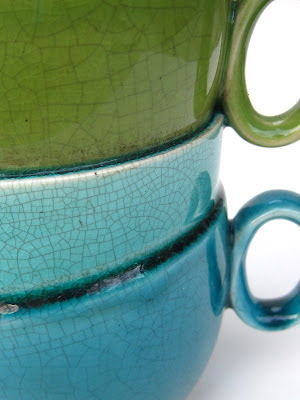 What do these five patterns have in common? 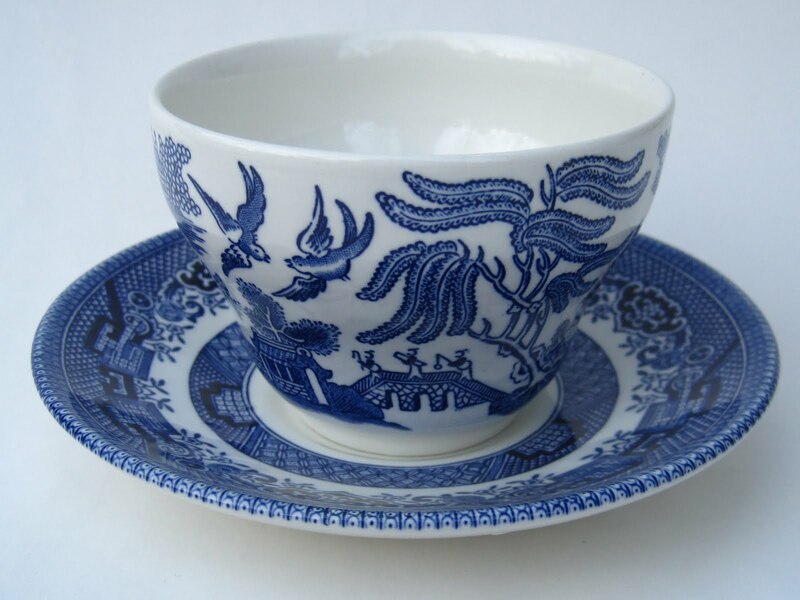 This is a detail from the back of a Blue Willow pattern teacup, this one from Churchill. I once read that the three little guys on the bridge are humorously called "the communists" because they're always leaning left, and whether that label is true or not, they are indeed always leaning in that direction! This teacup is in Royal Albert's Old Country Roses pattern. This is one of my "everyday" dishes, Johnson Brothers Rose Chintz. This is a dessert plate from Spode's Christmas Tree pattern. And this is a Johnson Brothers His Majesty pattern dinner plate. I just finished reading a book which informed me these five patterns are all on a list together. A list of what? Any guesses? Tomorrow I'll tell! OK fellow Baby Boomers, who remembers Madge the Manicurist? Am I seeing a few hands go up in cyberspace? For 27 years, Madge as played by actress Jan Miner (may she rest in peace) promoted Palmolive dishwashing liquid by soaking customers' fingernails in the detergent. "It softens your hands while you do the dishes. You're soaking in it," Madge would say, prompting a hand to pop up out of the dishwashing liquid until she convinced the customer this was a good thing. That emerald green Palmolive dishwashing liquid is still with us, but so is an updated version, this Ginger White Tea variety. The Colgate-Palmolive website calls these new liquids "inviting, naturally inspired fragrance blends." 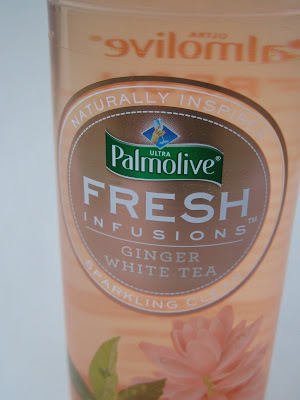 At first whiff, it smells a lot like the regular Palmolive liquid, which is not a bad thing, but once I used this liquid, I got a whole 'nuther scent experience, quite floral, quite lovely. 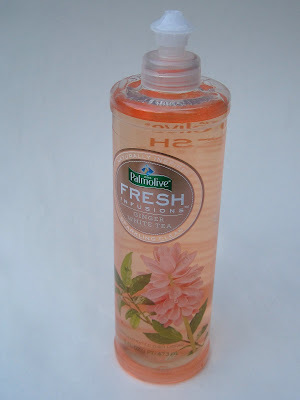 I went here to see if camellia sinensis was actually listed as an ingredient, and it is not, so I guess it's either part of the fragrance or part of the "natural inspiration" for this product. Still, I was impressed that the website does tell you what each of those ingredients is for! And if you don't remember our old friend Madge, here's a little You Tube reminder! 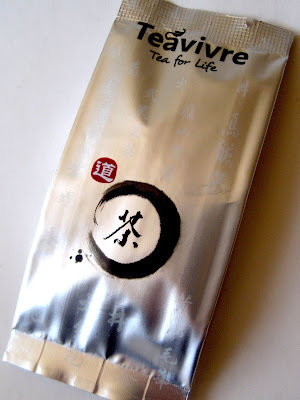 Sometimes, after I've sipped only flavored teas for a while, I start to crave a simple black or green tea instead. Happily, this latest craving coincided with the delivery of a generous box of new tea samples from Teavivre! 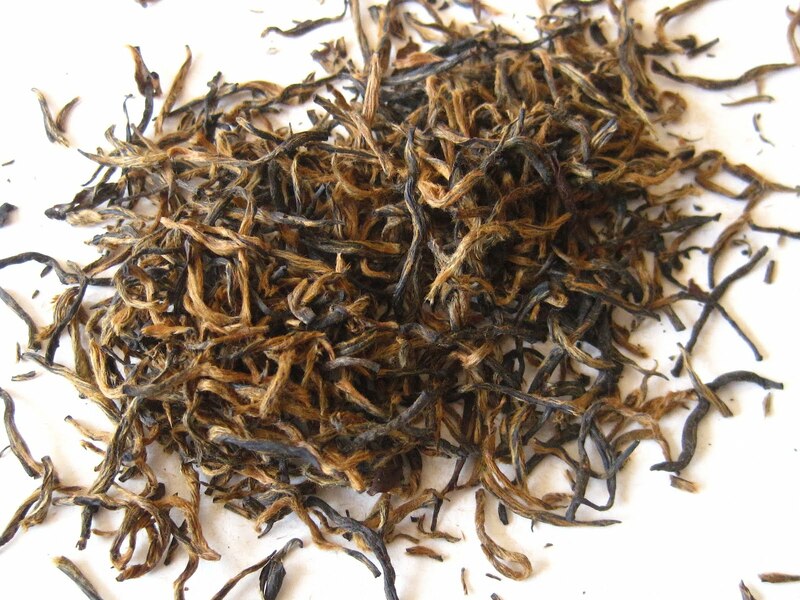 Here you can see the thin, wiry gold and brown leaves of their Superfine Tan Yang Gong Fu Black Tea. 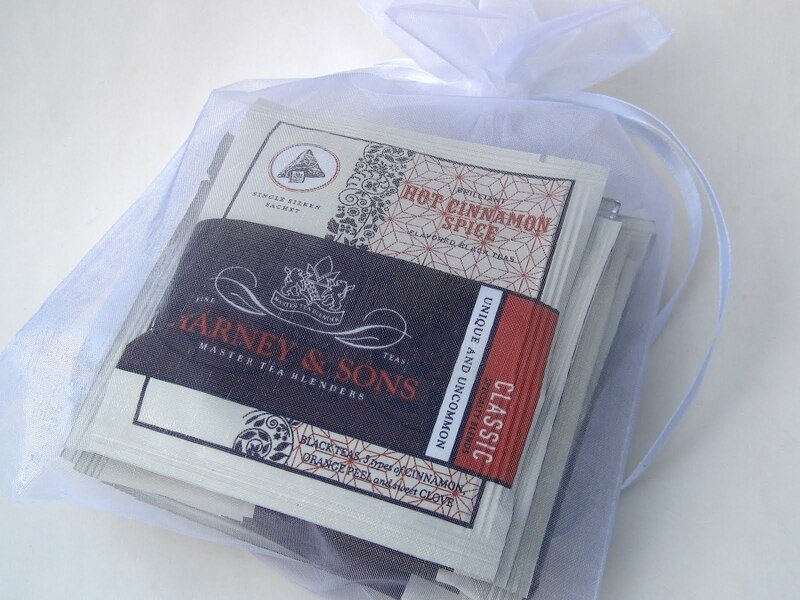 The tea comes in an individually sealed foil packet, and a wonderful woodsy scent greeted me as I opened it. I'm glad I read the directions for once, because I was intrigued that it said to steep this black tea at just 185 degrees for 1-2 minutes. I don't like my tea too hot or too strong, so I appreciated the guidance. I used my white porcelain tea-tasting set, which always makes me stand up a little straigher and take my tea tasting a little more seriously. I enjoyed smelling the aroma of the wet leaf, which was an even woodsier version of the dry leaf. 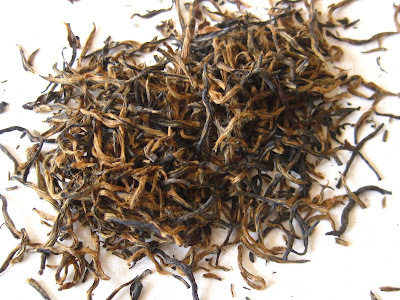 I recently walked by a construction site with a friend and sniffed appreciatively, for I love the scent of fresh wood shavings, and that's what this tea's scent reminded me of. The biggest surprise was the taste. 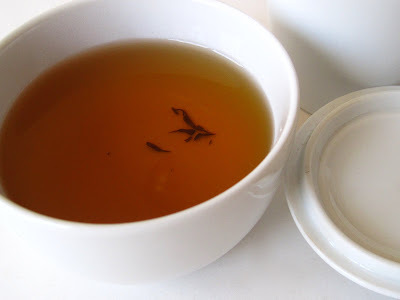 This was a very rich, smooth tasting tea, and there was a definite sweetness about it—with no sugar added at all! I swished it around in my mouth. I sipped. I savored. I even steeped the leaves a second time. Yes, that sweetness was definitely there, and I found it an almost honey-like sweetness. Only afterward did I read the Teavivre description of the tea, and that sweetness wasn't imagined--it's intended! 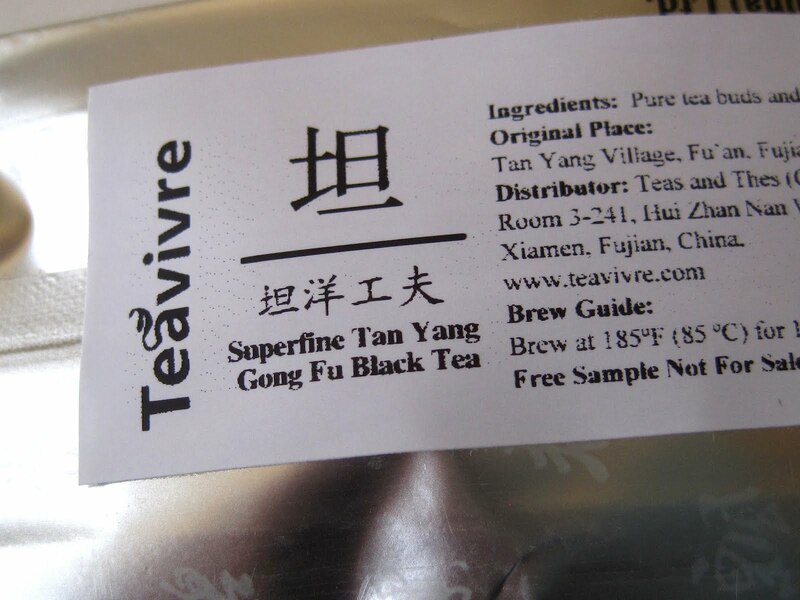 If you'd like to know more about this terrific tea, go here. 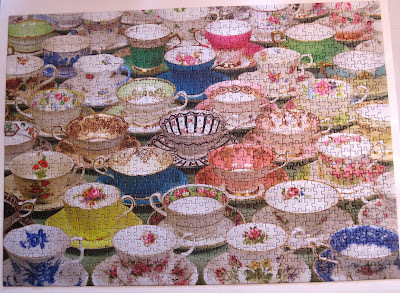 Back in November, I blogged about finding a teacup-themed puzzle I thought would be fun to put together over the holidays. Now, all I want to say is, friends, why didn't somebody stop me? What I *thought* would be a fun little two- or three-hour activity ended up taking me about a month to complete, consuming far more of my time, craft room and brainpower than I wanted. No more puzzles for this girl! 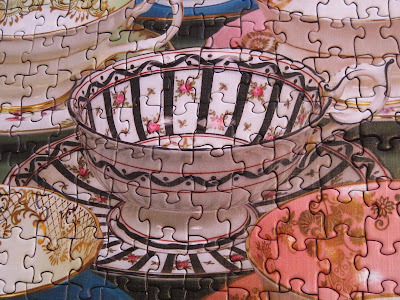 The one thing that kept me going was the realization that I wanted to hang this as artwork because I actually like some of these images, including this teacup, which was my absolute favorite. Now I'm not normally a huge fan of black and white teacups, but I think this one looks like what Audrey Hepburn would have sipped from in "My Fair Lady." No idea of the maker, of course, so if you ever see this one, holler, will you? Still, I am happy to be done with this thing. Just as I was finishing up over the weekend, I read an article about a convicted stock fraudster who was suing the Bureau of Prisons. He said his First Amendment rights were violated because he wasn't permitted to have a puzzle in his cell block. I say this: Let the guy have his puzzle, the bigger the better. Give him a sheet of notebook paper on which to assemble it. 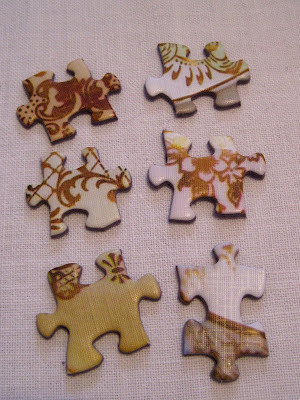 And leave about three of the pieces out of the box. That ought to set anyone back on the straight and narrow path! 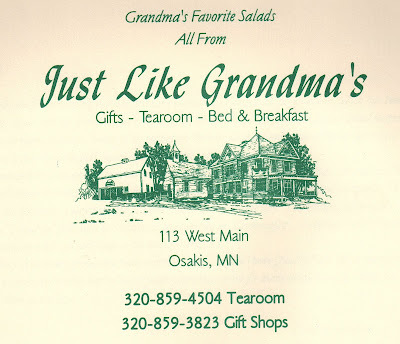 The majority of my tea room cookbooks come from places I've never been, and one that I do believe I would enjoy visiting is called Just Like Grandma's in Osakis, Minnesota. Apparently this tea room closes for the winter, and according to its Facebook page it will re-open in May. Any readers ever been here? Based on the recipes I've seen in this Just Like Grandma's cookbook, including the Chicken and Artichoke Salad I enjoyed this week, I would very much enjoy eating there! 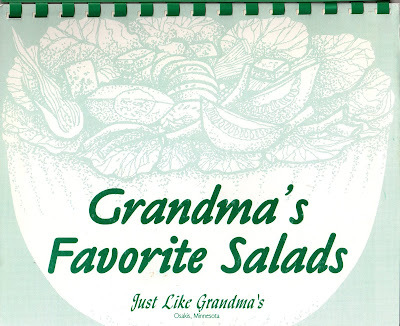 After all the heavy foods I've eaten over the holidays, the idea of anything with "salad" in the title greatly appealed to me. 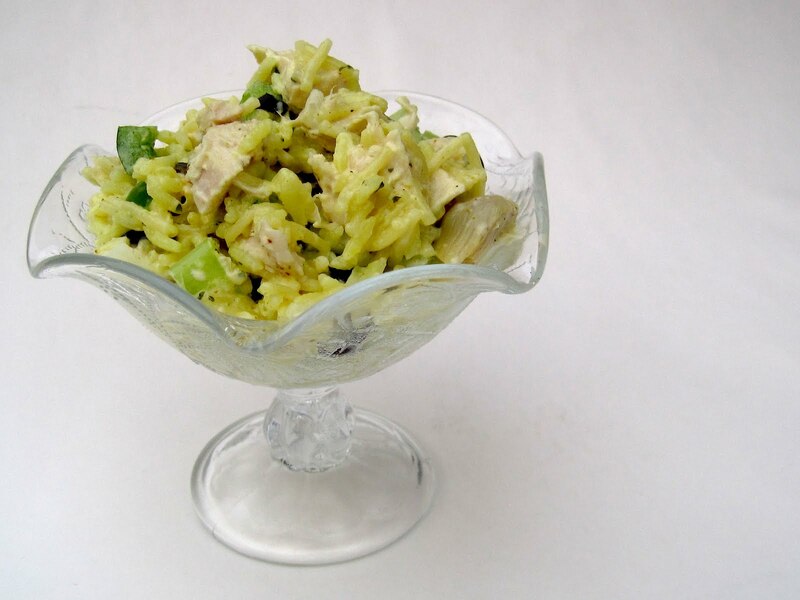 This recipe is attributed to someone named Shan. I don't know Shan, but I surely did love Shan's recipe! My husband did too. He's an artichoke fan, so I figured he would like this, and it was such a great flavor change that I think we both appreciated it even more. It called for just 1/8 teaspoon curry, and I questioned whether that was enough since I really love curry. Indeed, this small amount added just the right zip to this salad! Cook rice according to package directions, reducing water by 1/2 cup. Let cool. Add artichoke hearts, olives, green pepper, celery, onions and meat. 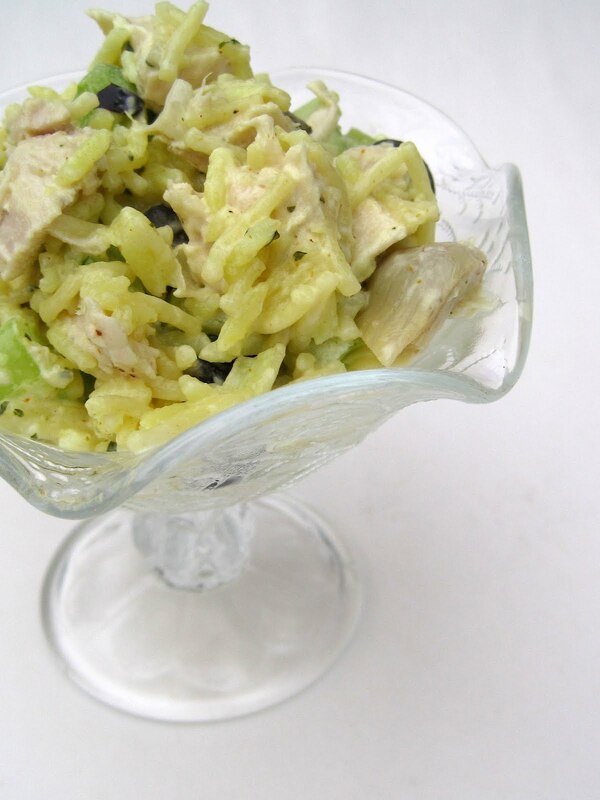 Mix reserved marinade with mayonnaise and curry powder, then add to other ingredients and blend well. Refrigerate until serving. Serves 4-5. 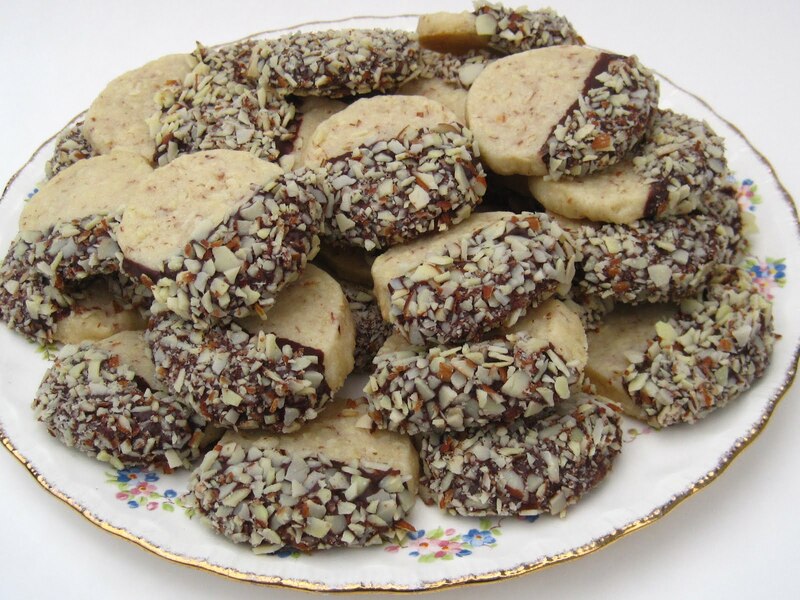 This recipe was labeled a "Tea Room Favorite," and I can certainly taste why! It seems my tea book Wish List grows longer, not shorter, each year. I've told myself that when the day comes that I read a tea book and don't learn something new, I'll stop searching them out and reading them—and of course that day never comes! 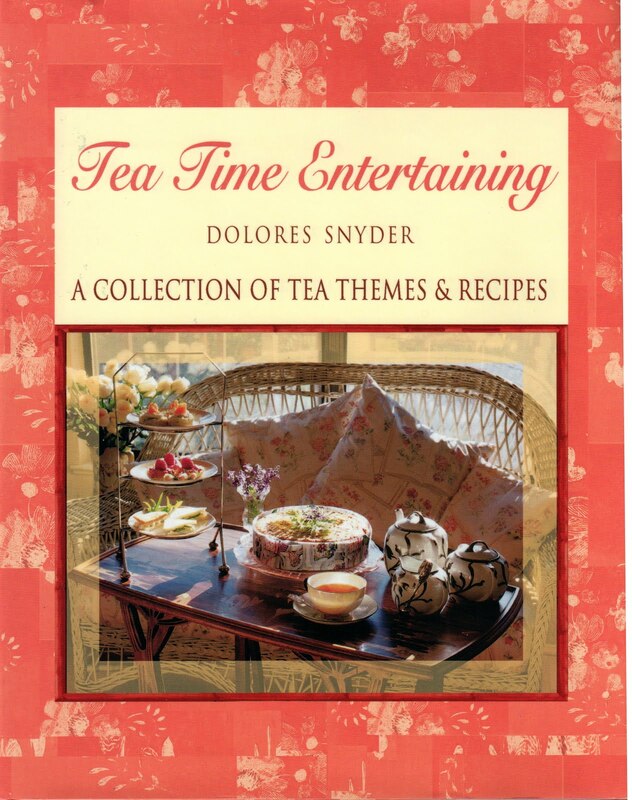 My latest read is a book I've had on the list for a while, a 2004 release called "Tea Time Entertaining" by Dolores Snyder. Now I like most tea books, but I must tell you that I absolutely love this one. Part of the enjoyment is, I just like *her*. Dolores not only loves tea, but she also has been trained at some of the world's best cooking schools and gotten to know some real food luminaries, in addition to becoming a cooking school teacher (and popular speaker) herself. 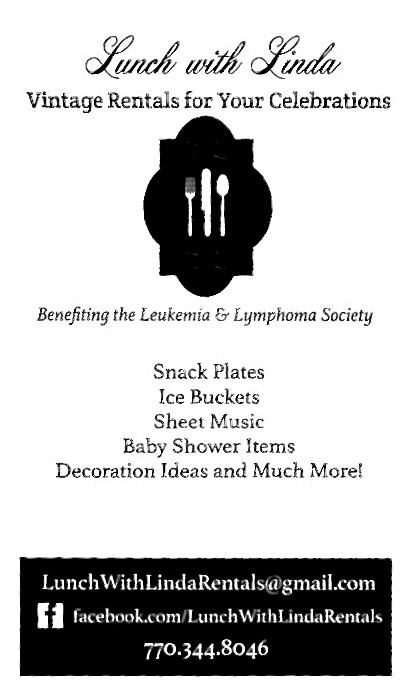 This Texan is a founding member of the James Beard Foundation and even hosted a tea-cooking seminar as a fundraiser for the organization. For all that, she comes across as "just another tea lover" who happens to have done some pretty amazing things, and I absolutely love that about her. The book includes a section on tea history, where I learned that "Queen Victoria enthusiastically endorsed this new ritual of afternoon tea with a passion and often baked the sweets herself for her Prince Consort." Don't think I've ever heard that before! 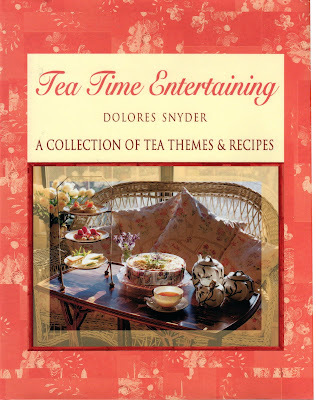 There were some fun accounts of memorable teas Dolores herself has enjoyed (with Greer Garson, for heaven's sake! ), and she also gives a brief listing of some teatime customs around the world—including a list of places very helpful for adding to one's teatime Bucket List. She does a nice, thorough job of covering all the teatime basics, which makes this a terrific book for a tea newbie, though there's also plenty to entertain those of us who've been to this rodeo before. 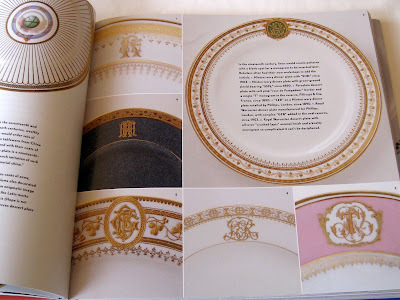 The 120+ recipes in the book are divided by theme, such as Garden Party, Queen Victoria's Birthday, Corporate Tea, Picnic in the Vineyard, Valentine Tea for Lovers and, appropriately enough for a Texan, a Queen's Tea Southwest Style (Smoked Texas Turkey Triangles, Cinnamon Basil Scones). Among the recipes I'd most like to try are the Queen Mother's Favourite Tea Cake, Dilled Scones with Smoked Salmon and the Queen of Sheba Chocolate Cake. This book was great fun to read, and because of the quality of the information and recipes I know I'll be turning to it again and again! 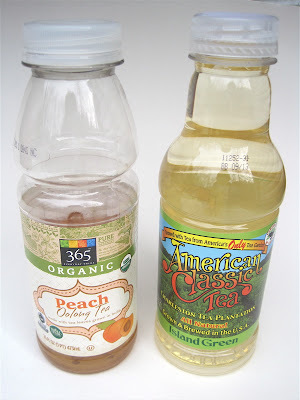 Every time I go to Whole Foods in Atlanta, I try to pick up at least a few new bottled teas to try. 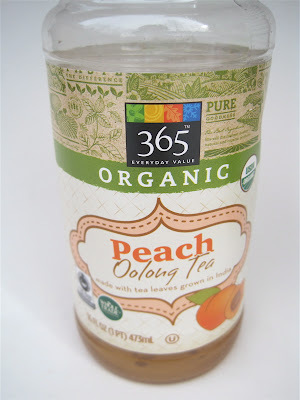 This time, I got their 365 brand of Peach Oolong as well as some American Classic Tea from the Charleston Tea Plantation. 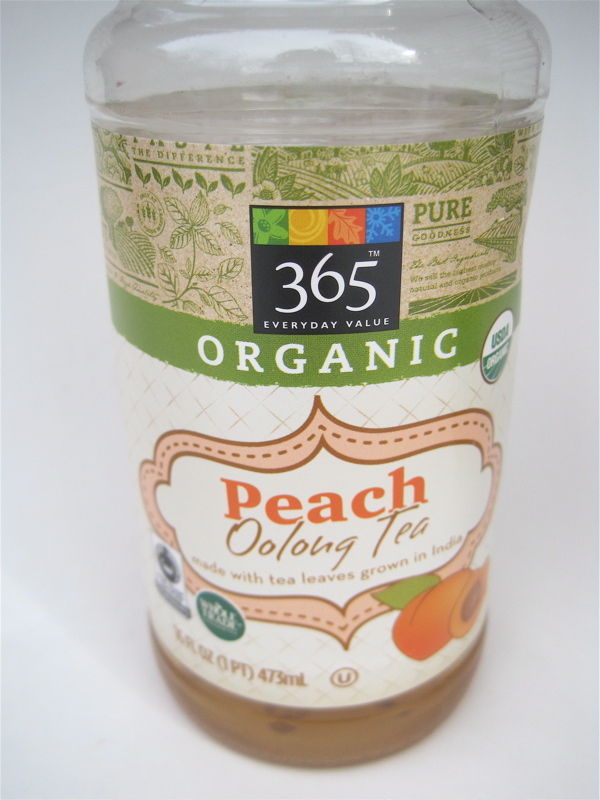 I was very pleased by the peachiness of the oolong tea, and this is the one I sipped on the way home (thus the bottle's only half full in the photo!). 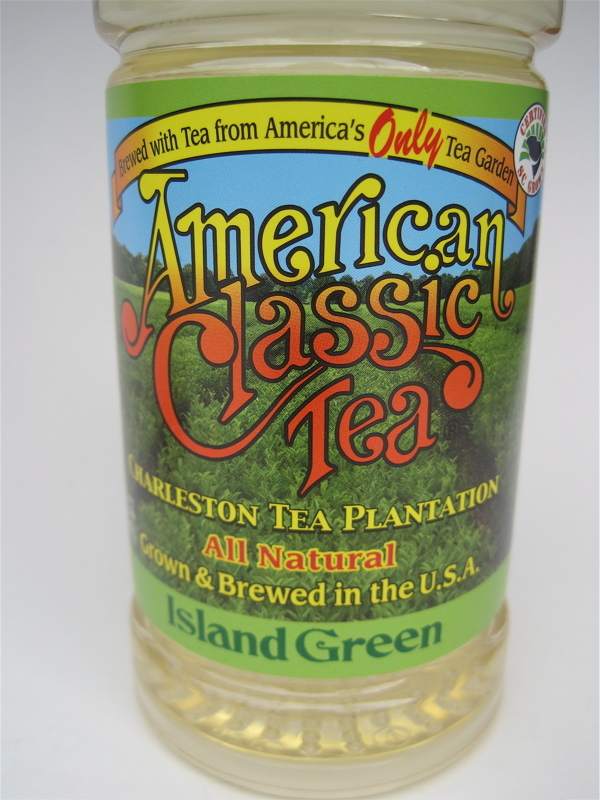 I was very surprised to learn the Charleston Tea Plantation has a bottled tea! This Island Green flavor was quite tasty, but—and you will be shocked to hear me say this—it was a little too sweet. It's sweetened with cane sugar and has 14 grams of sugar per 8-ounce serving. I drank this tea in two servings, so that was fine, but I do think I've grown accustomed to drinking the vast majority of my tea without sugar, and certainly no green teas I drink require it. 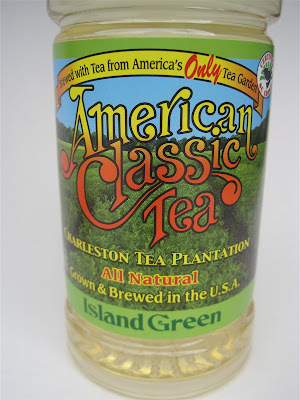 Have any of you tried this bottled tea from Charleston Tea Plantation? If so, what did you think? Calling prizewinners Marie and Jackie C.! Marie wins the gift certificate!